These really are the Perfect Meatballs with Ground Beef and Italian Sausage giving them the BEST flavor. Almost makes me think I’m Italian! 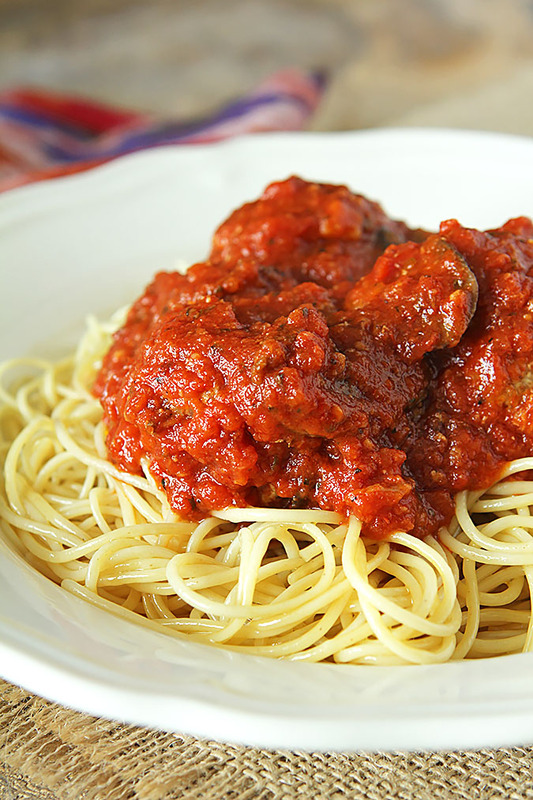 For the majority of my life, the only meatballs that ever graced a plate in front of me probably came out of a can…or maybe were frozen and thrown into some sauce before serving. And that was OK; I wasn’t the one in charge and I didn’t know any different and somehow I survived. Until I had one; you know, a REAL meatball. It quite simply started a couple of years ago when I was putting some things away in the freezer and spotted two packages sitting next to each other. One was hamburger and one was Italian sausage. Knowing I already had some homemade spaghetti sauce in the fridge, my brain did a quick computation and I was inspired to use those ingredients to make some meatballs to pair with that sauce. I’m sharing them again today because when I made them this past week, I took the time to get some better photos and yes, they do look yummier! I didn’t have a favorite recipe so did a quick search and found a recipe from Anne Burrell. She also include veal but I ignored it and enjoyed her suggestions for spices which includes some red pepper flakes. Not hot but a very slight suggestion of heat…I LOVE that, don’t you? Anne Burrell drives me batty but I’ll give her this…first, I love her name (says Barbara Anne) and yes, these are amazingly fabulous meatballs. Not having any breadcrumbs or desiring to dry out bread and make some, I substituted panko crumbs for the breadcrumbs called for in her recipe and it was so perfect that I think THEY need to be the norm. I mean so perfect I could have eaten them alone without spaghetti or sauce but I have to tell you that the classic Tomato, Butter and Onion sauce from the late, great Marcella Hazan that I had on hand was phenomenal with them. A simple sauce made from only those three ingredients, it was divine. Known and loved by many, it’s a great recipe to have on hand when you want something easy and yet so tasty. With these meatballs. Heaven on a plate I tell ya! As a matter of fact, next week I’m sharing the Meatball Sub Sandwiches we enjoyed with these…don’t miss that either! If you’ve already been combining ground pork with your ground beef to make meatballs; try the pork Italian sausage next time. I bet you’ll enjoy it as much as we did. I added some mushrooms to the sauce and we loved the combination but I’m sure it’s just as delicious if you are not fond of the fungi. Let me know though if you agree that these truly are the best meatballs EVER! Coat a large saute pan with olive oil, add the chopped onion and bring to a medium-high heat. Season the onion generously with salt and cook for about 5 to 7 minutes until soft and aromatic but not long enough to brown. Add the garlic and the crushed red pepper and saute for another 1 to 2 minutes. Turn off heat and allow to cool. In a large bowl use your hands to squish together the meats, eggs, Parmesan cheese and bread crumbs. Add the cooled onion mixture, season generously with salt and mix everything up a bit more. Add the water and do a final squish; the mixture should be quite wet. If you want to test your seasoning; take a bit of the mix and cook it in a skillet with a small amount of olive oil; add more salt to your mixture if needed. Shape the meat into desired size meatballs. I make mine approximately 1.5 - 2" diameter. Coat a large saute pan with olive oil and bring to medium-high heat. Brown the meatballs on all sides. Place them on a cookie sheet lined with aluminum foil and bake them in the preheated oven for about 15 minutes or until the meatballs are cooked all the way through. 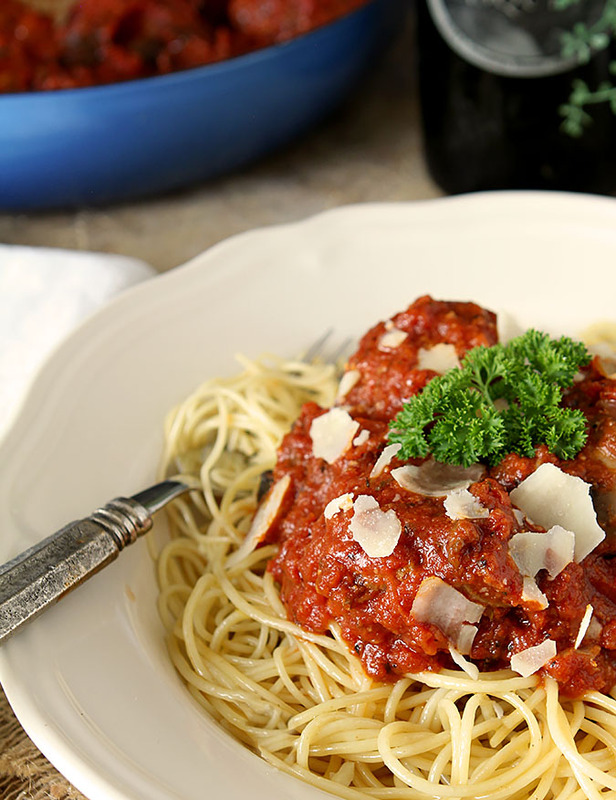 Serve over pasta and finish them with your favorite sauce. Top with Parmesan cheese and enjoy!! Wow!! 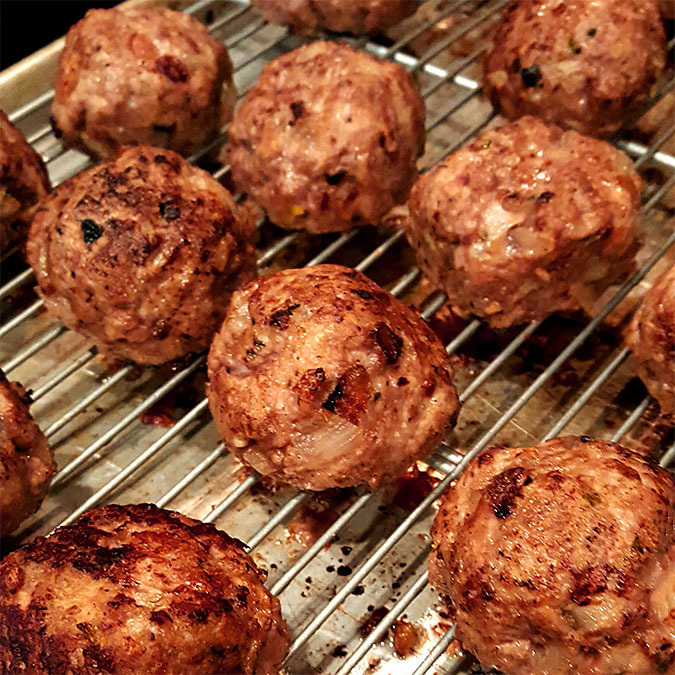 I just made this meat ball, they are so good. Thank you so much. You are most welcome; glad you enjoy them too! These are delicious. I’ve made them twice now and will be pulling my final stash of meatballs from the freezer for dinner tonight. I have been experimenting meatball recipes for some time now and this is a winner. However, I will need to confess. It always cracks me up when people comment about how great a recipe is then they say “ BUT I changed the “X” ingredient to Y ingredient ……”. Oops, I did the same this time. I only had Asiago cheese so I used that instead of Parmesan cheese. Delicious! Thanks for a superb meatball recipe. For sure a repeat recipe with Parmesan :). Flavor is really good. I love a good meatball. The only drawback for me is the salt. Seems to be a little too salty. I didn’t notice that…I sometimes think I undersalt things to make sure they’re not too salty, thinking it easier to correct if someone wants more. Luckily you can note that correction and I’ll take note too next time I make them, thanks for the feedback! Looks perfect Barb. My family loves meatballs. They were so good…I have never thought to include seasoned Italian sausage before and I thought it made such a difference while not tasting like Italian sausage either. Seriously loved them so much I’ve already made another batch for the freezer for my new meatball craving! We’ll have to just call them Colorado Meatballs then! I love meatballs…. mine are baked from beginning to end… no frying. Love the sound of your sauce! I loved the sort of crunchy crust that comes from frying them a bit but either way is fine I’m sure. The sauce has to be tried; 3 simple ingredients do not seem capable of making something so decadent. My whole family are meatball lovers. They are going to love me (and you) for this. I do hope you make them, they were truly delicious. Isn’t it just the best? It was perfect here too; no reason to compete with spices; it just accentuated the rest of the dish perfectly. It’s weird, but I almost never make meat balls! And I loved them when I was growing up. But somewhere along the line I became a meat sauce person, and just never looked back. I love a good meatball hero, though, so I really should make these — they’d be perfect! Thanks for this. I love a good meatball! Every now and then I skip the step of browning them first and simply bake them– big mistake– I’ve learned my lesson. 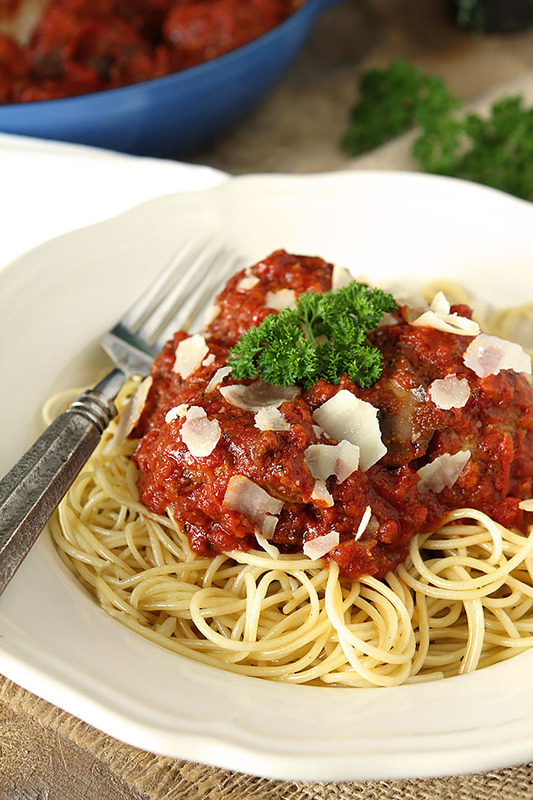 I make meatballs year round; they freeze so well that they make a quick and easy meal for me. Yours do look perfect! I love meatballs either on top of spaghetti or stuffed inside a bread roll. John, on the other hand, doesn’t share the love so I rarely make them just for myself. After looking at these photos I’m gonna do it! I haven’t had good meatballs since I last ate my Mom’s homemade spaghetti and meatballs. I remember that she always pan fried hers so seeing that you browned yours first and then baked them really has me intrigued. They look wonderful and I think using the Panko crumbs was a great idea, as was using the two types of meat. I can not remember the last time I had some Paula…funny how the desire to make something hits us isn’t it…but so glad I made these. Craving more of them so bad!